Here at the library of Blekinge Institute of Technology we are glad to have two library directors from Rwanda visiting for two days. This time we focus on anti-plagiarism and support to researchers but we also try to find time to explore resources like the bibliographic databases Scopus and ISI Web of Science. 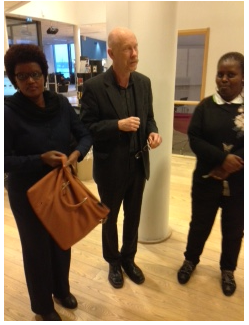 Here we see Marguerite and Fébronie together with librarian Kent Pettersson who has been in Rwanda several times.